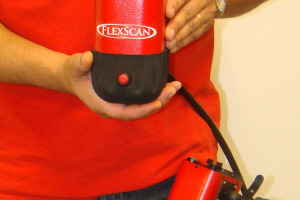 The 4200 FlexScan Series FTIR (handheld) is a dual module system the optical module weighs 3 lbs and it is attached to the 4 lb electronics module by a power cable. The electronics module can be worn on a belt or in a shoulder pack. The 4200 analyzer uses the same interferometer and optics as the 4100 ExoScan and thus has identical performance. The 4200 FlexScan is for dedicated field applications and has a fixed sampling interface that is specified when the system is ordered. The light weight of the hand-held optics and sampling module make it well suited to repetitive infrared analyses over a large area, or numerous measurements over a large object. Following on from the rapid acceptance of the handheld 4100 ExoScan FTIR, the Agilent 4200 FlexScan FTIR is a handheld FTIR designed specifically for various surface analysis applications, with the flexibility to be used in the most inaccessible of locations. The 4200 FlexScan FTIR employs the optics, electronics, power supply and sampling technology of the 4100 ExoScan FTIR and splits them into two modules — the optics module, which contains the interferometer and sampling interface, and a power module, which contains the battery and system electronics. The optics module fits comfortably in the palm of your hand. The power module can be hooked to your belt, or suspended from a shoulder strap. The compact dimensions and light weight of the optics module means you can conquer a host of previously impossible field-based applications that demand FTIR performance equivalent to traditional benchtop lab systems. If you need to perform FTIR analysis in out-of-reach places such as inside vessels, you can simply attach the optics module to an extendable arm. If you need more stability, mount it on a tripod. Effortlessly perform repetitive measurements, such as analyzing numerous points over a large surface area. Ease-of-use is crucial for performing analyses in the field. With the 4200 FlexScan, simply push a button on the optics module to analyze a sample. Control the system and view data with a handheld computer. A variety of sampling interfaces are available to meet your specific application requirements. Choose from external reflectance, grazing angle reflectance, ATR, or diffuse reflectance. With this versatility, you can analyze a range of metal, polymers, plastics, composites, in addition to most solids and granulated materials. The grazing angle interface has an angle of incidence of 82 degrees making it ideal for the analysis of very thin (sub-micron) films. The ATR interface is ideal for the analysis of solids, liquids, pastes and gels. The specular reflectance interface allows the analysis of films and coatings on reflective metal surfaces such as aluminum or steel. The ATR interface offers an ideal solution for the analysis of highly absorbing solids and liquids. 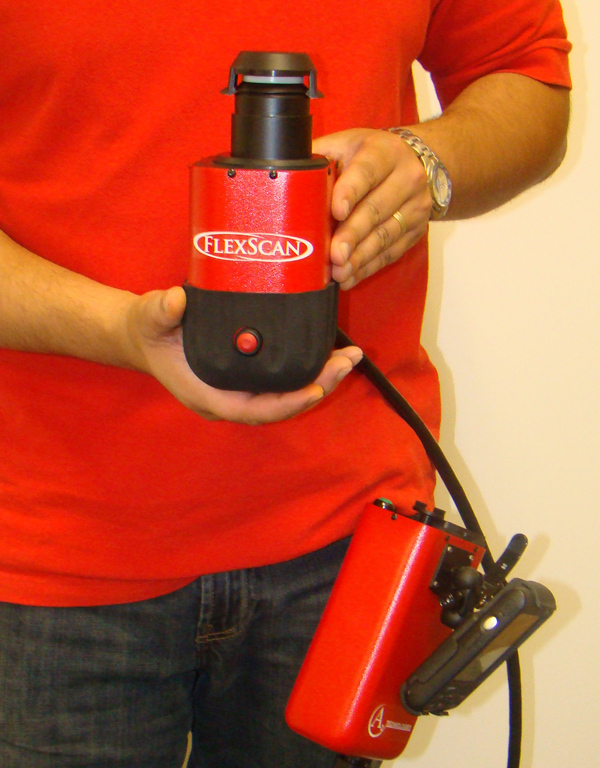 The diffuse reflectance sampling capability allows the 4200 FlexScan to tackle an increased number of important applications, including artwork, soils, rocks and minerals, composites, rough plastics, fabrics and corrosion on metal surfaces.